Route 50, The George Washington Highway, West Virginia. 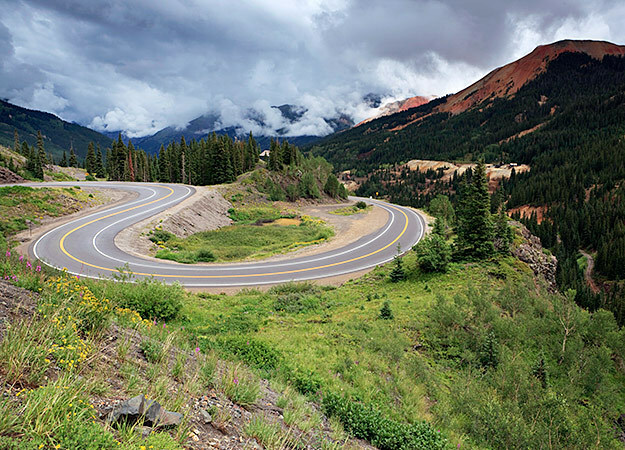 How do you feel about lots of twists and turns? 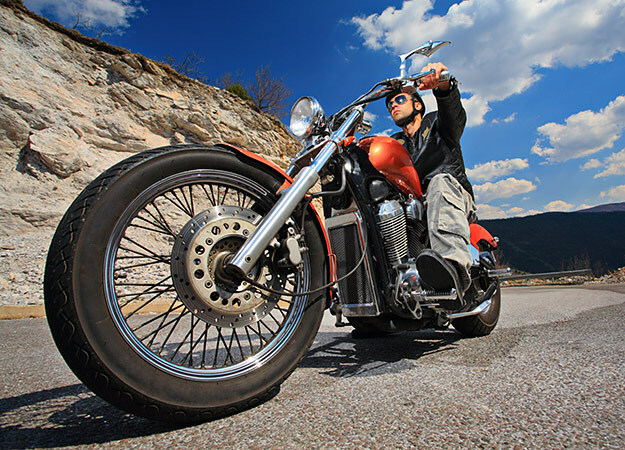 What a crazy question … motorcycles were MADE for twists and turns. Mountains … check. Rivers … check. Scenery … check. On the George Washington Highway, you’ll ride just north of the beautiful Monongahela National Forest, and pass Cathedral State Park along the way too (which is a nice midway point stop). 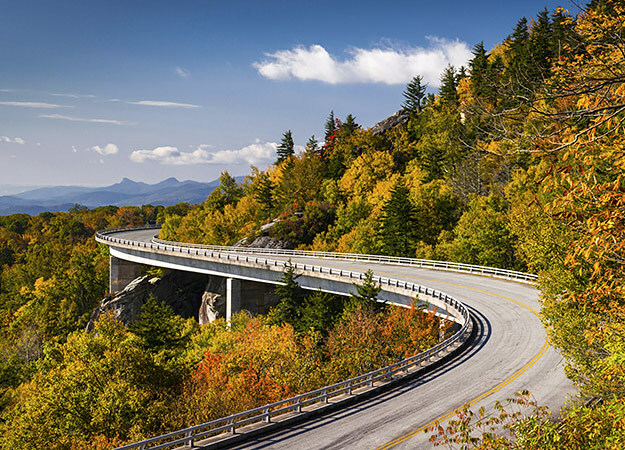 And there’s an added bonus — once you’ve finished this adventure you are right there for two more of the East Coast’s best rides — Skyline Drive and The Blue Ridge Parkway! 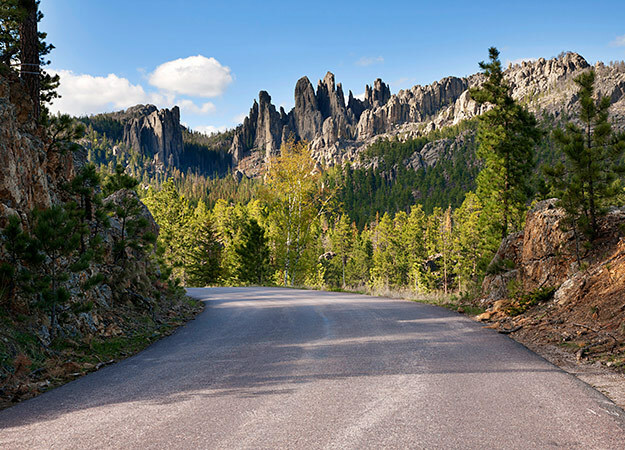 Needles highway is one of many roads you can take to get to the Sturgis Motorcycle Rally each August, and it feels like it was designed just to be experienced on a bike. Riders who have whisked their way along the roads to get there often find themselves going much, much slower once there, without even realizing it. As for wildlife that might cause one to pause … how about bison up close? And you’ll get to see the actual spots where “the deer and the antelope play.” Really. Just like the song. 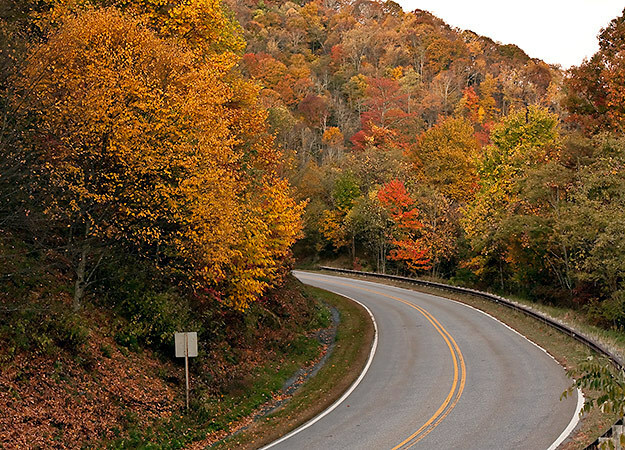 It takes quite a bit of confidence to claim to be America’s number one motorcycle and sports car road, as the website for Tail of the Dragon does. But with 318 curves in 11 miles, and one bodacious name, who would quibble? Bordering the southeastern portion of the Great Smoky Mountains National Park, the ride can be spectacular. If your tastes run to the macabre, check out the “Tree of Shame,” a monument to the unfortunate souls who have crashed their bikes along the Tail of the Dragon. Bike parts are nailed to the tree and dangle from branches. And just in case you need more testimony to its awesomeness, Tail of the Dragon is a Hollywood favorite … having been featured in movies and television shows, including The Fugitive and Top Gear. Blue Ridge Parkway wanders through the Virginia countryside featuring a fair share of the local charms … like an old mill pond with a working millwheel, as well as fascinating Civil War battle sites. The lower half runs from I-77 to Cherokee, NC. There you’ll see the great Smokey Mountains of North Carolina, with countless overlooks to view the beautiful Smokies. Below Ashville, NC are some of the greatest mountain views in the eastern U.S.
One of the best parts of this road is the fact that the only trucks ever encountered are the few service truck that service the two service station/restaurant areas along the parkway. Also, the 45 mph limit makes lends itself to enjoying the surrounding scenery as safely as possible. Of course you are. Well, this road will most definitely provide that. It has more ups and downs that a soap opera marriage, very few guard rails and scenery you will never forget. Everything from incredible mountains, dense forest, rivers (and even great rocks) … to snow and tundra. If you had to construct a great bike ride, it would look a lot like Beartooth Pass. Expect to see as many bikes on this road as cars. And you know that feeling when a roller coaster plunges straight down, and your breath leaves you for a second?There’s a lot of that here, too. Quite conveniently, San Juan Mountain Skyway is a loop, so you can start anywhere and take it either direction. And if there is a more beautiful section of the Rocky Mountains, we haven’t seen it. 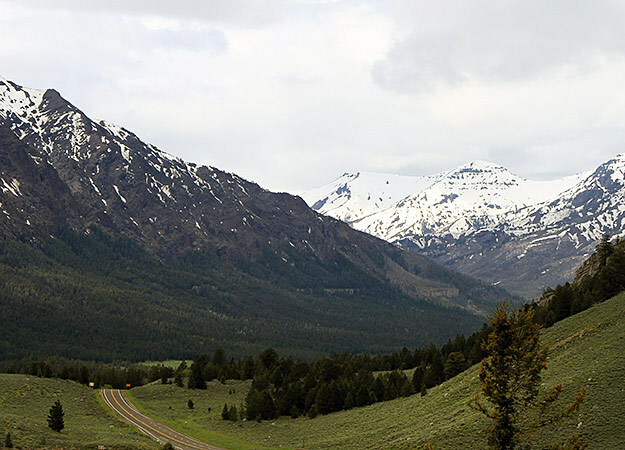 You’ll pass through historic mining towns, national parks and forests and world-class ski resort areas. The San Juan Mountains are home to many of Colorado’s elite group of 14,000 foot mountain peeks. 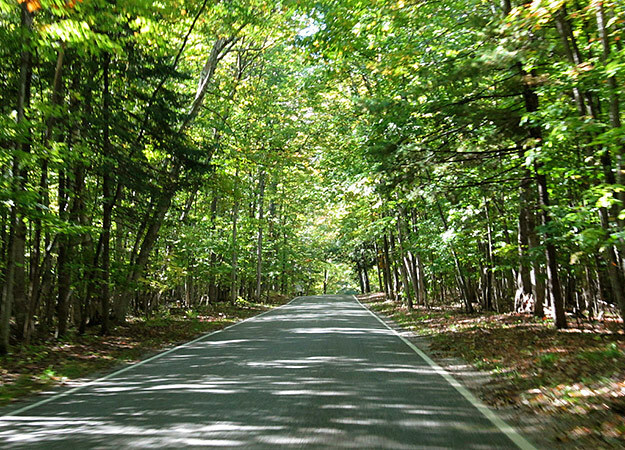 The Tunnel of Trees Road is … not surprisingly … one of the great forest routes in North America. It’s located about 35 miles from the very popular tourist stop, Mackinac Island, at the juncture of Michigan and Upper Peninsula Michigan. You and your bike will hug the eastern shoreline of Lake Michigan through a dense forest, one side offering glimpses of old summer cabin homes tucked back in the forest, while the other side brings a quick peek or two of the Lake Michigan shoreline. Ride north around the harbor to go through the town of Harbor Springs and up the coast … the Northern Michigan coastline is just spectacular. 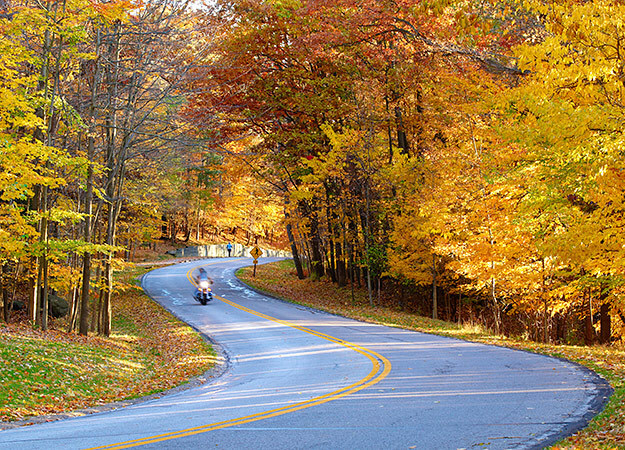 Tunnel of Trees Road is perfect for a fall ride during the color change — try it in September for the very best vistas. But be warned … It can be desolate at night and extremely dangerous in the winter months. There are no facilities other than restrooms for the entire 40 miles. The town of Ozark lies between Little Rock and Fort Smith, and that’s where you’ll want to pick up this trail, so aptly named in the state that made Razorbacks famous. 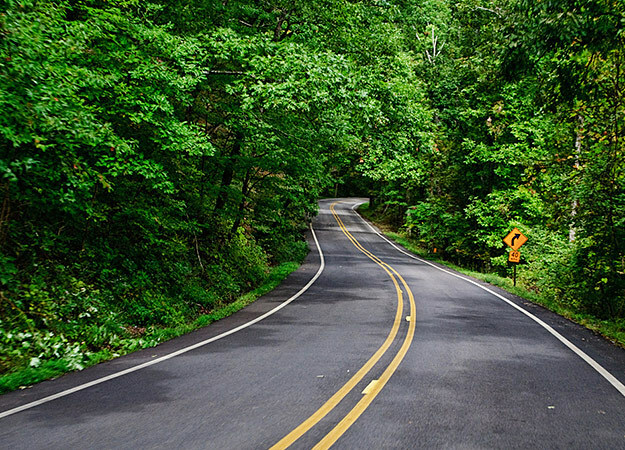 The rugged and forested Boston Mountains region of the Ozark Mountains is the setting for this route, which often runs through a tunnel of foliage during spring, summer and fall. Spring wildflowers and brilliant autumn colors make the route especially popular during those seasons. The route crosses the Mulberry River and the 165-mile Ozark Highlands Trail. 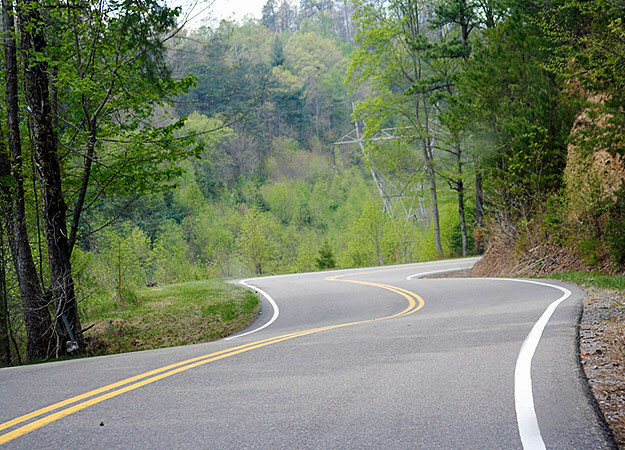 And you’ll encounter various hairpin turns, straightaways, and drop-offs where the cliffs seem to be right next to you. Three Sisters starts in Medina, TX, and offers a 131-mile experience that will change your image of the state of Texas (unless you’ve already taken the ride, of course, in which case it will reinforce that image). Think Texas landscapes are flat and boring? The Twisted Sisters beg to differ. Breeze along beside clear rivers, maneuver your way along very twisty mountain-like curves with the added attraction of real J.R. Ewing, Texas-style ranches all around you. And if you’ve a mind to do some fishing between rides, the Nueces River holds largemouth bass, smallmouth bass, and the native guadalupe bass, along with a variety of panfish such as redbreast sunfish, rock bass, green sunfish and Rio Grande perch. Better keep the bike handy, though … the river is home to lots of gators, too.